It's November...you know that what means! Crunchy leaves falling. A cool chill in the air. The end of political attack ads for a couple weeks. And of course....it's almost turkey time! There's a billboard around town here' in the 'burgh for the local gas station promoting the Pilgrim - a roast turkey sub piled high with cranberries, gravy and trimmings on a "stuffing bread." That sounds as awesome as it sounds gutbursting. There's all sorts of other turkey wraps and sandwiches around, including TJ's somewhat disappointing one from last year. But a totally tubular Thanksgiving turkey treat, and not in the '80s' sense? 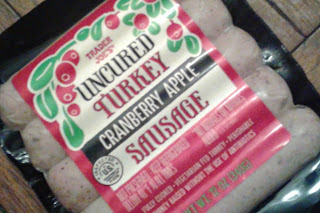 For me, unheard of...until now, Trader Joe's Uncured Turkey Cranberry Apple Sausage. 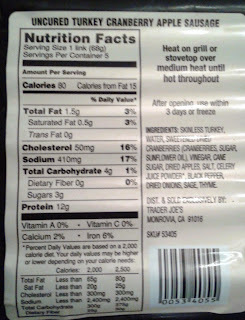 Turkey as an alternate meat can either work pretty well or not so great when trying to emulate other protein products. See: turkey bacon. Pork sausage is usually pretty greasy, so a drier, leaner meat like turkey has to be done well to make an acceptable swap-out in my eyes. Well, Trader Joe's tried. They really, really tried. But as an old wise little short green man once told me, "Do or do not. There is no try." So, TJ's did not. There's just enough not flavor or execution here. First, they're pretty dry. And then, the turkey itself is fairly bland. "Well, that's why they'd add some cranberry and apple, that oughtta fix that," you're now thinking to yourself. You'd be right except...it doesn't. 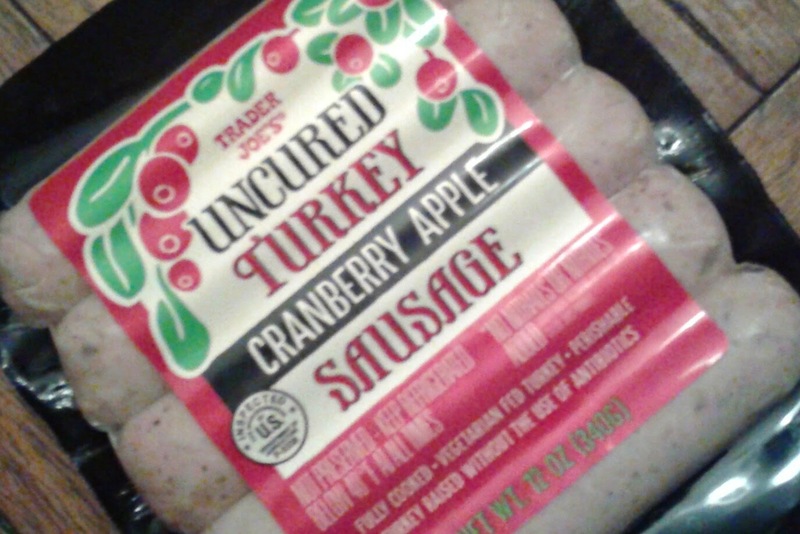 In one of Sandy's sausages there was a deep, large well of red that I presume was the cranberry. That's the only discernible cranberry any of us had in the whole package of five we cooked up. There were little chunks of what I presume were apple (kinda gray/tan/light colored) but they didn't add much of anything one way or the other. In the end, they just kinda lacked. To be fair, I suppose if one were to purchase and prepare these not with the though of festive fall flavors but instead a reasonably healthy sausage option, these links wouldn't seem nearly as disappointing. That's a more than valid thought. 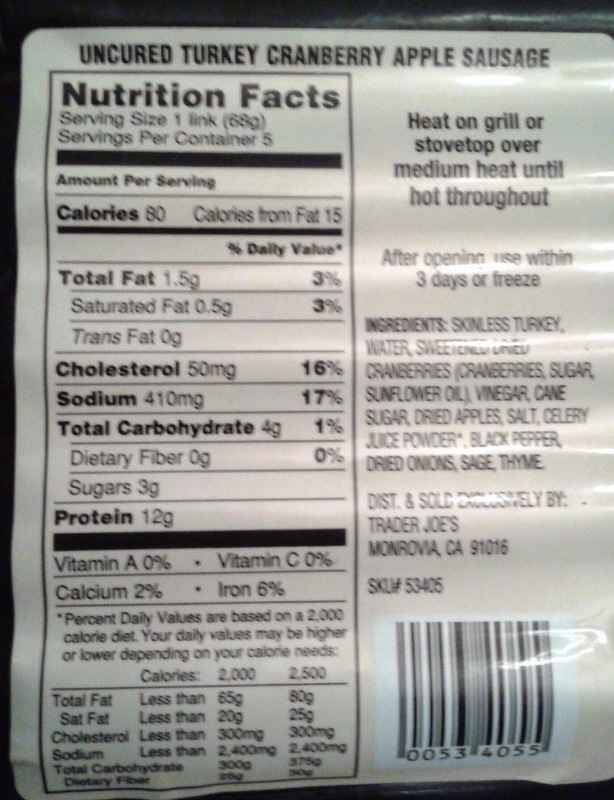 Sodium's kinda high, but uncured, low fat, heck, not even preservatives - they're practically paleo which works for me. Sandy made a face when I mentioned I'd be reviewing these. "Ugh, if we never got those again, that'd be more than okay with me - I just didn't really like them," she said. She seemed to verbally waiver between around a two, so that's what we're going with for her, which sounds just 'bout right to me. Someone @TJ's was having a boring day when they came up w/this concoction.. lol btw Hatch Valley is sold out of our TJ's... good news, the fresh tamales that are seasonal have hit our stores!. Wait, fresh tamales??? What part of the country? In tthe refrigerated section?? My first thought when I saw this sausage in the new TJ Thanksgiving flyer is that I might use it in stuffing. And then they had that suggested recipe inside. Do you think it might be good in a cornbread stuffing, with mushrooms?